Divorces are lawsuits that require your husband notify you of the divorce filing. If your husband doesn't serve you with notice of the divorce, the divorce cannot proceed. If you and your husband reside in different states, that complicates this requirement. Finding out whether or not your husband filed for divorce is not difficult, even if you haven't been served with papers yet. Ask your husband. This is the simplest way to confirm if your husband filed any legal documents. 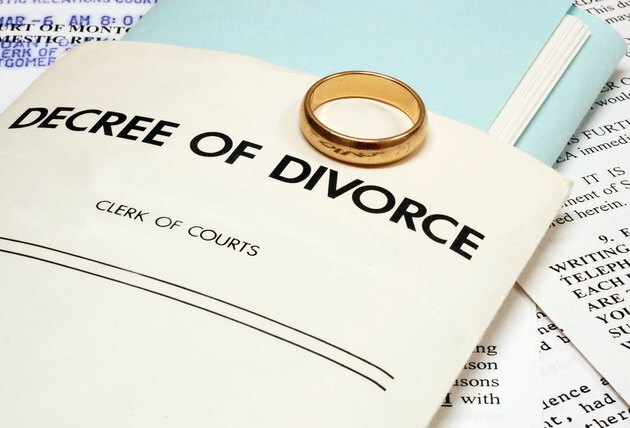 If you haven't already received a certified copy of the divorce through the mail, or personal delivery by a law enforcement officer or process server, ask your husband for a copy of the papers. Double-check mail you received and look for official court documents you may have overlooked. Ask your attorney if he received a notice of the filed divorce. Your attorney knows how to search court records for recently filed documents. Ask the court clerk. If you don't have an attorney, talk to the civil court clerk's office in the county courthouse in which you and your husband live. The divorce must be filed in a county of residence. Some courts have searchable databases in which you can look up a case by a litigant's name. Check the local newspapers of record. Sometimes people accomplish service of process by publishing notices in the local paper of record. The process governing this procedure varies by state, but it typically only happens if personal or mail service is not possible. Contact your local courthouse and the courthouse where your husband lives, and ask what newspapers publish these notices. Then contact the newspapers and ask how you can search for recently published service notifications. Talk with an attorney. Every divorce case is different, and you should always seek qualified legal advice from an attorney whenever you have a divorce question.